The newly established Center for Prevention of Organized Crime and Corruption (BORKOR) will be transparent and trusted, the prime minister has said. The center will work together with similar units in the police and the State Agency for National Security, which is the equivalent of the US Federal Bureau of Investigation, Boyko Borisov told reporters in Sofia on Thursday. The unit will be headed by Rumen Milanov, Borisov's security adviser. 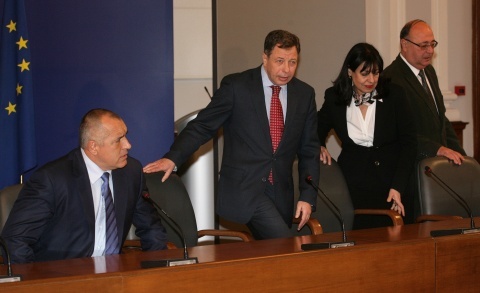 The former Director of the State Agency for National Security (DANS), under the term of the previous, Socialist-led cabinet, Petko Sertov, will be Milanov's assistant together with Eleonora Nikolova. The center will operate analytically, but will not have operational functions, according to Eleonora Nikolova. "We will have only analytical functions and will be able to review the case only as a technology, but we will not have any operational functions," said Nikolova, who is an expert in the parliamentary committee for combating corruption and conflict of interests. Nikolova refused to comment on the appointments in the new unit, saying that the professional qualities of Sertov have been assessed by Borisov. "The prime minister is personally responsible for this center, so the assessment is up to him," she said. The new unit will deal with discovering and countering cases of corruption at all levels of local, executive and legislative power. BORKOR would not be a double of DANS and is using a German model with the help of German experts. Just a day earlier the director of the Bulgarian State Agency for National Security (DANS), Tsvetlin Yovchev, unexpectedly resigned as the Bulgarian government has been rocked by a spying scandal for weeks. The decision has been prompted by the government's consistent lack of trust in his skills, Yovchev said in his motives. The news came just days after a bomb exploded in front of the offices of Galeria, an anti-government newspaper, in downtown Sofia. Right after the blast occurred last Thursday Prime Minister Boyko Borisov instructed Interior Minister Tsvetan Tsvetanov and DANS head Tsvetlin Yovchev to take urgent measures and arrest the masterminder. He pointed out his assessment of the work of the two top cops will depend on their performance with respect to the Galeria explosion. Last month Galeria published transcripts of taped phone conversations between senior government officials and Customs Office chief Vanyo Tanov, which prompted Prime Minister Boyko Borisov to seek and win a confidence vote in Parliament on Jan. 20. The tapes, whose authenticity is still not verified, allege that the government of PM Boyko Borisov is favoring certain companies and individuals with respect to investigations and appointments in the Customs Agency. Prime Minister Borisov, who made his name fighting corruption as mayor of Sofia, swept to power in 2009 with the promise to clamp down on rampant graft and organized crime. Bulgaria has been ranked the second most corrupt country in the European Union only after Greece in a corruption perception index by Transparency International, a Berlin-based watchdog.